SAN PEDRO-The long arms of the law reeled in a fugitive who was on the run from San Pedro police. Jason Gillett, 25, of San Pedro, who has been on the run from Monday, August 18, was captured on Friday, August 22, in the San Mateo area after eluding police for five days. 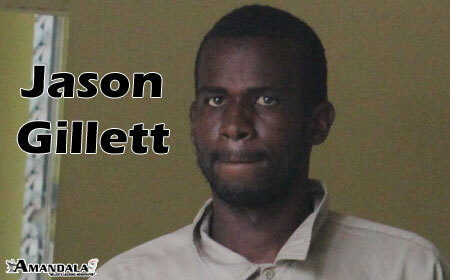 Gillett was wanted on charges of attempted murder and aggravated assault with a firearm, and was taken to the Belize City Magistrate’s Court on Monday, where he was arraigned on the charges and remanded to the Belize Central Prison until October 24. Inspector Jemmott, the Deputy Commander of San Pedro police, told Amandala that there was no magistrate in San Pedro, so Gillett was taken to Belize City Magistrate’s Court to be remanded for the charges. A wanted poster had been issued for his arrest, and he was declared to be armed and dangerous. Police said that at about 9:30 Monday night, August 18, Gillett ambushed Jermaine Zuniga, 28, also of San Pedro. He came out of the bushes and fired about four shots at Zuniga, and then escaped back into the bushes. Luckily, Zuniga was not hit. Zuniga told police that he was riding his bicycle, heading home in the San Mateo area, when he saw a man stooping in the bushes near the roadside. As he approached, the man jumped onto the road, took out a gun and fired at him. Zuniga quickly jumped off his bicycle and ran. After escaping unharmed, Zuniga went to the police and made a report.